Annual awards recognizing excellence in SMA investing revealed at Envestnet Advisor Summit, led by Cushings energy MLP strategy. Tim Clift of Envestnet | PMC (left), SMA Manager of the Year Libby Toudouze of Cushing, and Jamie Green, Editor of Investment Advisor magazine. For the 11th straight year, Envestnet | PMC and Investment Advisor recognized excellence among separately managed account managers by awarding nine SMA Manager of the Year honors, along with a 10th award given this year to Cushing Asset Management as overall SMA Manager of the Year. Two new awards were instituted this year: an “Impact” award for excellence in socially responsible investing—to Dana Investment Advisors, represented by portfolio manager Duane Roberts—and a “Strategist” award honoring Frontier Asset Management, with founding principal Dave Miller accepting the award. 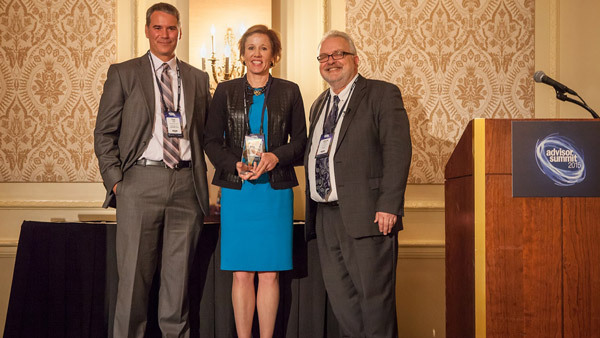 The overall SMA Manager of the Year honor, chosen from among the individual award honorees, was Cushing Asset Management’s Core MLP strategy, represented at the ceremony by Libby F. Toudouze, portfolio manager and Swank Capital president. Last year was a tumultuous year for energy prices, the presenters said in announcing the award for Cushing, making volatile alpha difficult to find, particularly in the MLP space. However, Cushing’s strategy rode through the turmoil, and when the year was done it had outperformed its index—the Alerian MLP Index—by over 17%. In accepting the award, Toudouze credited the “phenomenal team” at Cushing for its 2014 performance, notably Cushing Managing Director John Musgrave. Raub Brock Capital Management for its Dividend Growth portfolio. Led by Richard Alpert, managing partner and portfolio manager. Chartwell Investment Partners for its Small Cap Value strategy, led by Senior Portfolio Manager and Managing Partner David Dalrymple. Congress Asset Management for its Mid Cap Growth portfolio, led by portfolio manager Todd Solomon. “In a volatile year, Cushing’s strategy rode through the turmoil and when markets dipped, they dipped significantly less. When the year was done they outperformed their index (the Alerian MLP Index) by over 17%. — See all the conference coverage of the Envestnet Advisor Summit: 2015 on ThinkAdvisor.